The Door Youth Project is well known for their innovative fundraising events and this next one is no different. 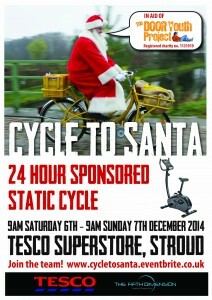 ”Cycle to Santa” is a sponsored 24 hour static cycle ride outside Tesco’s Superstore in Stroud on the 6th and 7th December. So how is the team going to cycle to Santa? Well the distance to the North Pole from Stroud is 2645 miles. Yes that is an impossible task to achieve in 24 hours but the team are hoping that if they do really well, Santa will meet them half way. Hannah from Fifth Dimension who are official sponsors for the event comments on what it has been like to be an ongoing supporter of The Door Youth Project. The winner of the three months gym membership with the fantastic Fifth Dimension Gym is the person who raises the most in sponsorship there’s also a two month and one month for the 2nd and 3rd.